The bathroom is part of our daily ritual. For many of us , it is the most private room in the house and a place to get away for a short while from the noise, stress and pressures of the day and the world we live in. I think of the bathroom as one of the most important rooms in any home: it is the space where most of us start and end our days. And although the basic functions of the bathroom continue to be the same each and every year, the bathroom is evolving and changing to adapt to our lifestyle and the way we live in the 21st century. 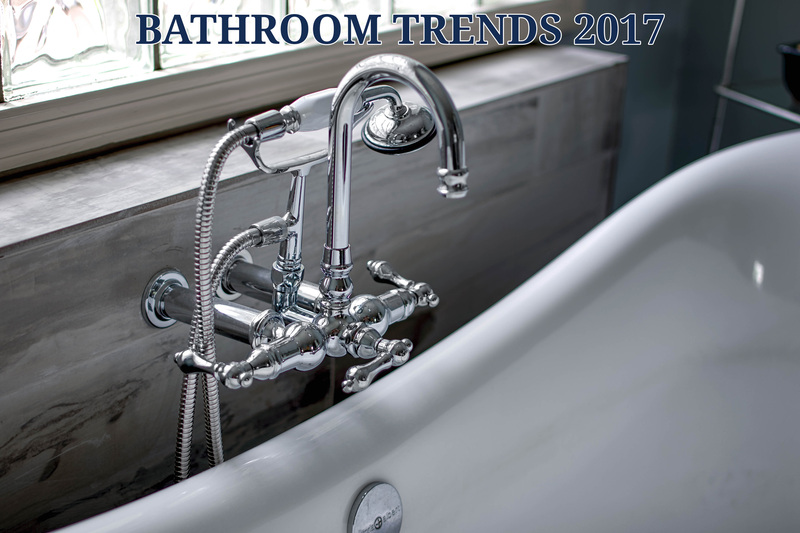 Looking ahead, there are some trends and features that I believe will be important and long lasting as far as function and style go for bathrooms in 2017. Many are already here and will only continue to grow in popularity, while others are fairly new to the market, although present in the European market for several years. If you are planning to build or renovate your bathroom space in the next 12 months, incorporating some or all of these trends will not only give you a more enjoyable bathing experience, but will add value to your home when you decide to sell. Smart Storage Today’s bath designers know that a beautiful bathroom is an organized bathroom. When you are in a hurry in the morning, you don’t have time to be searching for your hair brush or favorite tube of lipstick. Today’s world is hectic and stressful enough without wasting time in the rush of the morning. Cabinetry manufacturers are now offering many interiors options to help you keep all the essentials right at hand. You now have options for keeping small appliances such as hair dryers and curling irons plugged in and ready to go with built in drawers and pullouts specifically designed for them. Drawer dividers for toiletries and makeup are becoming essential in vanity designs, much like they have been for years in kitchen design. Even the tried and true medicine cabinet is now becoming the epicenter for organization, with many new models featuring built in electrical and USB ports for charging devices as well as keeping electric razors, toothbrushes, all in place and ready to go. 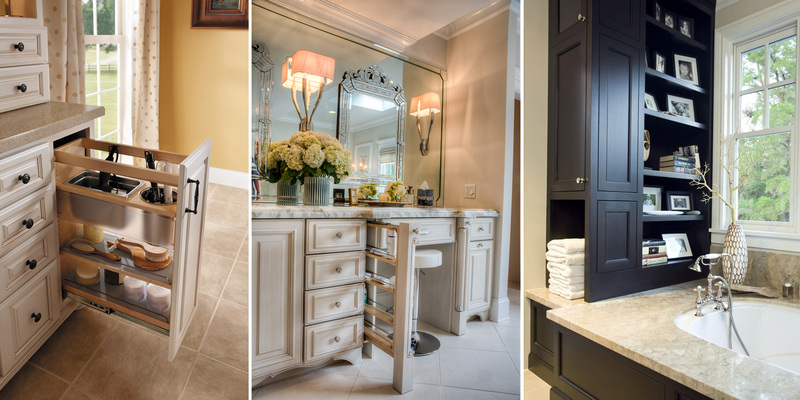 When designing your new bath, smart storage is a trend that will always be in favor. Dimensional Tile A trend that began in Europe a few years ago, we are now seeing the possibilities of dimensional tile making big waves in the latest designs of bathrooms. Advances in waterjet technology have given tile manufacturers new ways to express themselves and the results are incredible. Whether in natural marble and stone or in a porcelain composition, these fantastic tiles bring drama and style into the bath. 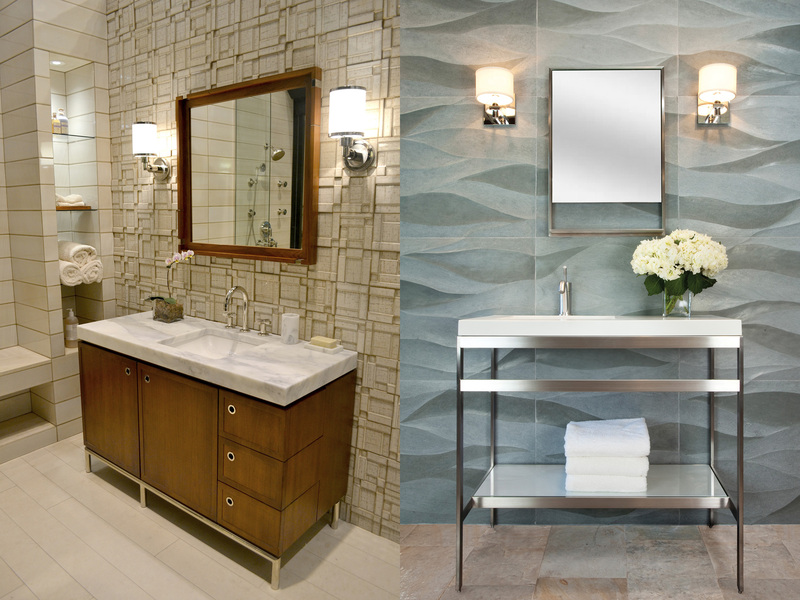 In much the same way that wallpaper and fabrics add pattern and visual interest to a room, these dimensional tiles can take a bath from ordinary to extraordinary. Think of using them on an accent wall in the shower or behind a vanity and toilet area not only for looks but for practicality as well, being a much more durable and water resistant surface than sheetrock. On a limited budget, consider using these intriguing tiles as a panel in the shower or as a mirror surround above the vanity. Your bathroom is too important to play it safe and with these new dimensional tiles, you can have a look that will wow for years to come. Freestanding Tubs We have been seeing the freestanding tub gaining in popularity over the last few years and there seems to be every indication that this trend will continue into 2017. For years the master bath tub was front and center in every bathroom design and put on a pedestal—literally. Surrounded by marble or tile and raised up on a platform or deck, the tub and its surroundings grew in importance and size with each passing decade. 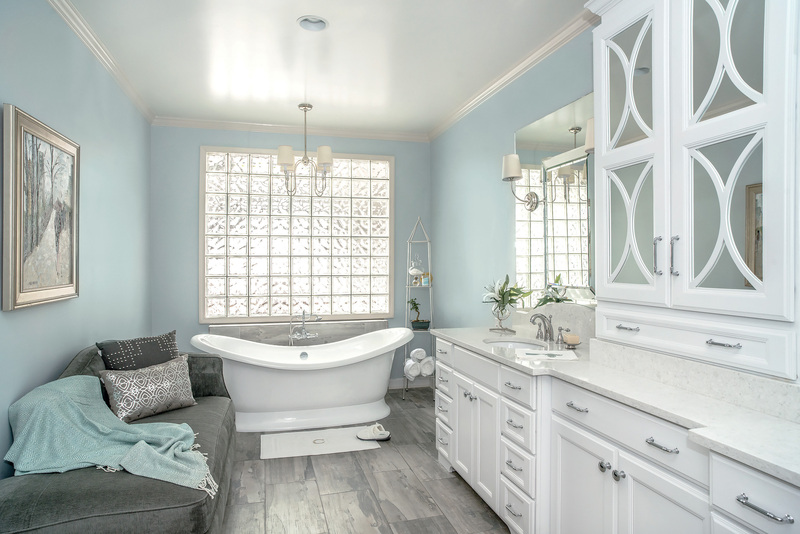 Currently homeowners and designers love to see the tub as a simple, beautiful piece of furniture in the bath with no surround, no steps, and no platform. Just the tub to stand alone, telling a lot about the style of the bathroom itself. It may be a simple soaking tub, or a therapeutic air tub with chromatherapy, heated backrest and built in speakers. But whether you select rectangular, oval, round or a shape that is more organic in nature, the tub for 2017 is sculptural and beautiful, taking on a quieter yet prominent place in any master bathroom design. Floating Vanities This is another trend that has been prevalent in Europe for many years but finally making it way to the States. The floating vanity creates a sense of space and openness even with the smallest of bathrooms. It offers the clean, transitional look that so many homeowners and home buyers want in a home today. Expect these vanities to offer drawers over doors in many instances, as a way to over more practical storage and, as stated above, smart storage is becoming standard in many of the well-thought out designs. But while they are stylish, they offer a few practical advantages as well. 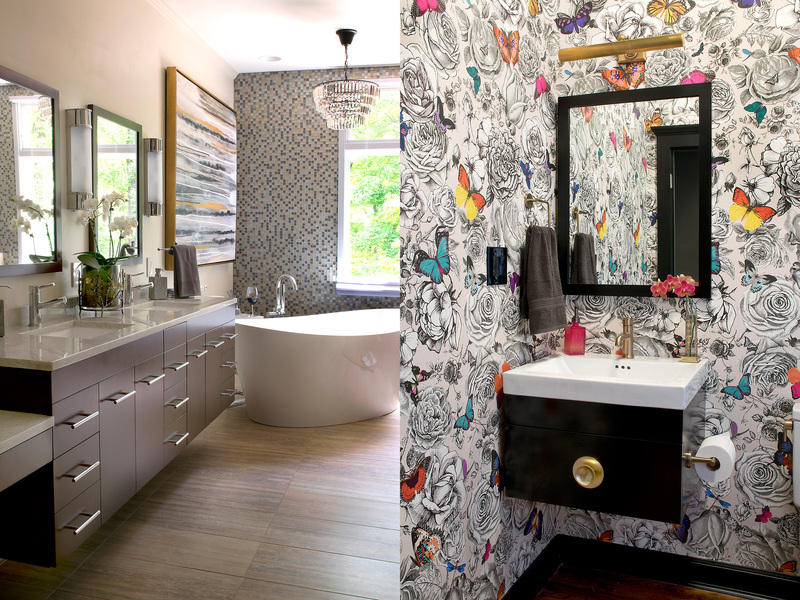 By its very nature, the vanity can be installed at just about any height. This is great for the homeowner that finds standard height vanities either too tall or too short. Next, by leaving an area of 12-18” open beneath the vanity, it makes for very easy cleaning. 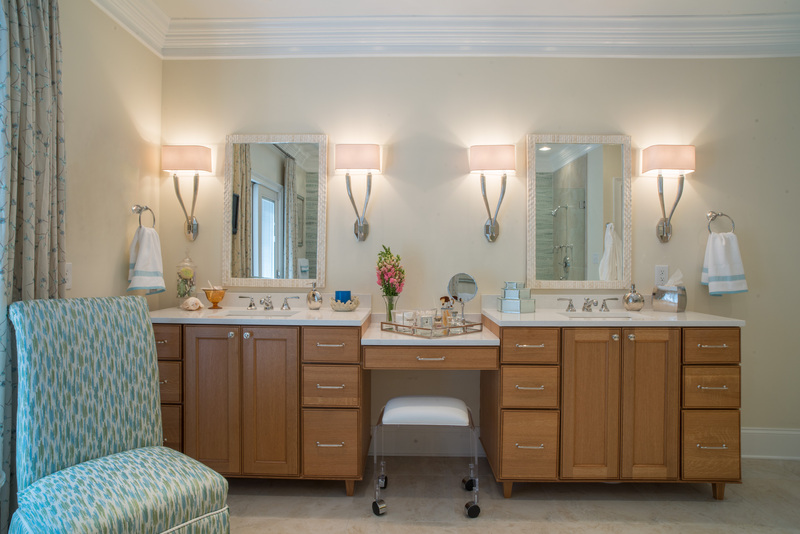 Whether you prefer traditional or modern styling, you should consider a floating vanity in your new bathroom design. Natural Woods While there is no denying the popularity of the current white bathroom with accents of grays and neutrals, we are seeing a strong trend to add the warmth and organic feel of real natural wood to the bath. It can take a rather bland and antiseptic bathroom design and infuse it with personality as well as bringing the element of the outdoors to the bathing experience. Look to the wood species and stain you have used in other rooms for inspiration and to connect the bath with the rest of the home. Whether it be a wood floor, a teak wood bench or mat, or the natural beauty of ceruse oak or walnut cabinetry, adding a real wood element into your bathroom brings life and visual warmth and style into the bathing space, while giving you a great texture to complement the smooth white paint and tile so common in bathrooms today.